Halloween is a sort of preamble for Christmas when it comes to sweet treats, so if you want to get and keep a good impression from your friends for the rest of the holiday season better start early by finding the best candy to give at parties or to treat-or-treaters. To make it a little easier for you, we’ve prepared a few suggestion for candy that people seem to like the most, judging by the reactions it received on retail sites. 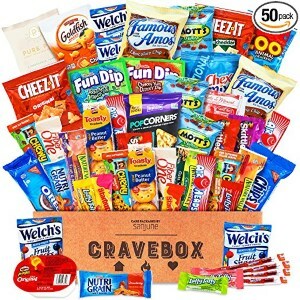 This package contains no less than 50 salty and sugary snacks neatly placed in a somewhat unassuming manilla cardboard box. It will make a great gift for kids away on summer camp or for adorning a snacks table at a school or birthday party. You’ll get plenty of variety, with chocolates, crackers, cookies, and saltines to name but a few, enough to satisfy every taste. Quality-wise, people who bought it only have good things to say about this selection, as it contains most of the popular brands out there in a high-value pack. As the name suggests, this is a pack of OREO cookies covered with a thick layer of milk chocolate. 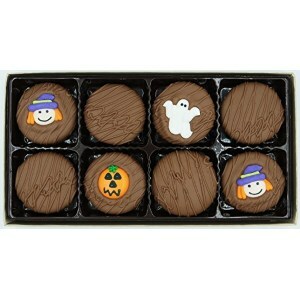 Since it’s been specifically intended for Halloween, 4 of the eight cookies you’ll get in a box are decorated with cute images of witches, ghosts, and pumpkins, made out of royal icing. Philadelphia Candies is considered to be one of the best brands for chocolate around, so these will definitely prove a delightful treat even for those who aren’t big fans of Oreos, and the specific theme will definitely be a nice touch for every children’s party. 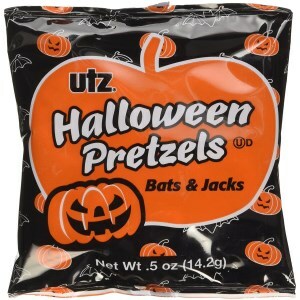 These Halloween pretzel bags should prove great to satisfy those with a salty tooth at a house or school party. 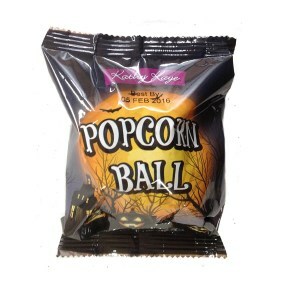 At only .5 oz per bag, the package provides individual servings, a total of 40 of them, so none of the kids will have to dip their hands in a common bowl, that might get contaminated by dirt or various allergens. The pretzels themselves are made in a facility kept free of peanuts but might contain traces of sesame seeds and milk from the production line. To keep with the Halloween theme, they’ve been shaped like either pumpkins or bats. For those unfamiliar with Wikki Stix, they are a modeling type of toy that allows children to draw out contours or build stringy characters, made out of knitting yarn and food-grade wax. As the list of “ingredients” suggests, these are not intended to be eaten — although they can be safely ingested — but provide an engaging alternative to the usual candy. 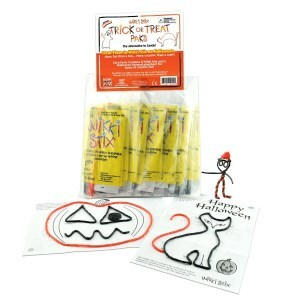 Each of the 50 packs contains a number of patterns the kids can use to create appropriate Halloween designs and the necessary material. If you want to supplement the contents of a treats table with something that can provide an opportunity for a little handiwork, the Wikki Stix will make a good choice! Popcorn balls are an old holiday favorite, and they can double as snacks or decoration, thanks to the interesting way light drops on their intricate surface. Taste-wise, they aren’t that different to regular popcorn and can be made either salty or sweet. You’ll find both varieties in this Halloween pack, with 24 of them in total, distributed in 2 separate bags. Salty, sweet and always crunchy, popcorn balls might be seen as an acquired taste by some, but they’ll definitely find fans among a large party’s attendance, with the added benefit of providing a festive display by just sitting there. 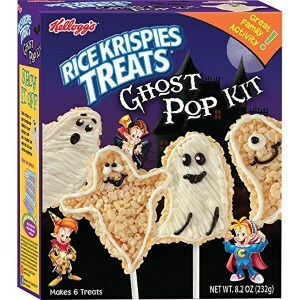 This special Halloween kit contains the famous rice crispy cereal from Kellogg’s, together with a number of culinary crafting ingredients that will allow your child to exercise some handiwork while also getting a delicious treat at the end. There are two molds for different ghost shapes kids could try out, as well as frosting for lines and texture, marshmallows for the eyes, one black icing pen, one piping bag and eight pop sticks, enough to make a total of six treats. Crafty children will surely find them engaging while younger kids might need some help getting the ghosts into shape, but regardless, these are bound to provide hours of fun! Although there are still a few months left before Halloween, preparing in advance never killed anyone. Halloween is one of the most imported Western traditions, and it is now celebrated in many countries around the world. From scary costumes to infamous Halloween parties, horror nights and evil pumpkins, Halloween is definitely a night to remember. For one night you get to be any character, monster or personality, dead or alive you want. For one night you get to dress in the most unconventional way and not be judged. For one night you get to eat tons of candies without any regrets. But Halloween is also a good occasion for children to show off their culinary skills and create their own themed parties at school while redecorating accordingly. If you or your kid is engaged in a school Halloween party, the first rule is not to panic. You will still have a few good days ahead to think about genius and inventive recipes which will look scary enough but will taste delicious. For those of you who are out of ideas or don’t have the necessary time for complicated recipes, we have compiled a comprehensive Halloween party guide to follow through. Read below to find easy and tasty Halloween recipes as well as how to create the most threatening decorations for your tasty foods. 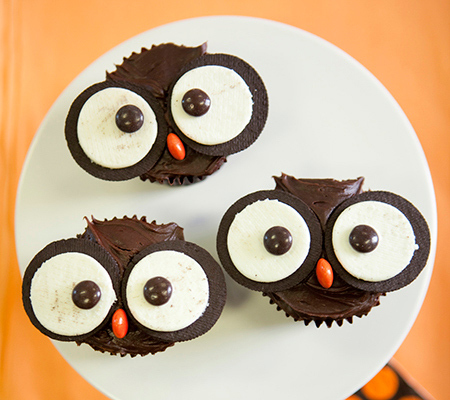 Whenever deciding to make your own Halloween treats, you need to take into consideration various factors. 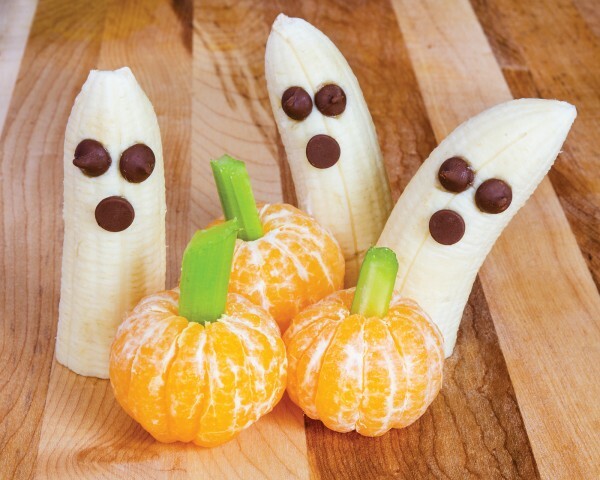 Here is everything we think you should know about bringing creative Halloween snacks for school. Although most Halloween parties are announced in advance, you may not always have the necessary time to prepare yourself accordingly. It is even more difficult if you’re just a kid and your parents won’t have the time to help you out. Therefore, if you can plan in advance, you should do it. Make sure to purchase all necessary ingredients, frostings, and accessories one – two days before the actual baking and cooking will take place. Make a list to be sure you didn’t forget anything. Having a fully equipped kitchen also helps so if your own kitchen doesn’t provide you with the required space or appliances it is best to opt for secondary, less complicated recipes or move the fun to another location, such as a friend’s or relative’s house. If you are not sure on your cooking skills either we suggest two options; you either start a couple of days prior to the event to see how things work and exactly how much time you have, or you choose simpler recipes which can be done in a matter of minutes, preferably without too many exotic ingredients either. School parties are not what they used to be back in the days where you could bring anything, and everyone would eat it. Right now you have to carefully handpick all ingredients and make sure they are of high quality. Choose organic fruits and veggies and always state exactly all the ingredients you used for making the dish. Many people are allergic to different food compounds or ingredients. We also suggest you stay away from the most common ingredients that can cause food allergies or poisoning – nuts, soy, sea fruits or dairy products. If you must use them in your dishes, state clearly exactly the ingredients you used. We suggest you even put a small warning for those who want to eat your products but are known to be allergic to some of the ingredients. We also suggest replacing some of the dairy products you may have to use with either organic ingredients or vegetal-based substituents like soy milk or coconut milk, as well as ground flour or olive oil instead of regular frying oil. Make sure you pick the items yourself. Halloween is usually associated with a pumpkin festival where people decide to integrate the flavor in the most uncommon dishes in order to create unique and seasonal flavors. Obviously, pumpkins and squashes should be your main ingredients for the school party as well. And, since it seems America is absolutely crazy about everything pumpkin, you can even try your own inventions. Just don’t bring the pumpkin spice lattes to the school – we are sure America has already had enough lattes to last a lifetime. Before starting to look for recipes, we suggest you follow a certain logic for the process. Are you going to go for sweet treats or delicious appetizers? Are you going to focus on the main dish, a snack or a full menu? If you choose a complete menu, we suggest you combine the recipes so that they perfectly balance and complement each other. However, since we are talking about a school party and not some culinary TV show, it may be best to stick to what children and teenagers want most – fast and small dips they can easily bite without using forks or spoons. In other words, make your dishes simple and as tasty as possible. Nevertheless, before starting to cook, you should consult with others attending the venue and establish who is going to bring everyone’s favorite dishes. Each party is based on certain “star” dishes, famous and delicious. But, unless you don’t want 20 variations of pumpkin pie and no appetizers or “real food”, consult with the other participants and establish which dishes will be brought by each and every person. We also encourage you to don’t forget about beverages – both cold and hot. Hot chocolate and cinnamon-flavored coffee will certainly be a hit, so make sure you bring enough for everyone. Don’t forget about fruit punches and some freaky cocktails complete with Halloween accessories like monster eyes, gummy snakes, or anything equally creepy. Water is vital too so make sure everyone is fully hydrated after all pastries, pies, cakes, and cookies provided. Last but not least bear in mind that there is no Halloween without the famous treat bags so stuck on candies, chocolate and other sweet treats you can later offer to the smaller children.